Every year, for the past seven years, we have undertaken what we call a ‘Calendar of Goodwill’ through the month of December. The idea is that during this busy festive period we shift focus from receiving, to giving. 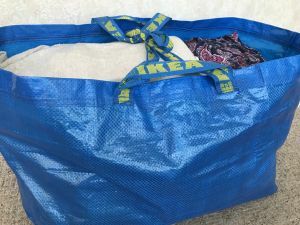 We consider our cosy home with radiators and fresh linen, and take a moment to think of those who have nothing more than a sheet of cardboard and the clothes on their back. We notice the people who have helped us through the course of the year but can often go a little under the radar. We spare a thought for the animals who through no fault of their own are without a place to call home in these cold winter months. I think becoming parents has really brought home to us that Christmas can be magical, and we always want our boys to enjoy the season, but that this time of year can become indulgent too. We want to ensure that whilst we have plenty of fun, we are being thoughtful to the community that we live in, and that our boys are a part of that. 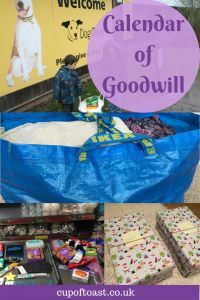 So the Calendar of Goodwill was born and each year we treat it like a type of advent calendar. The idea is really simple. Choose 24 little acts of kindness that you can do throughout the month to share some happiness. Aim to complete one a day, and if you can do more, even better. Ideally we think it’s great to choose your tasks as a family, but to get you started I have noted some below. My boys have had a lot of input with these too, and we hope that the suggestions inspire you! 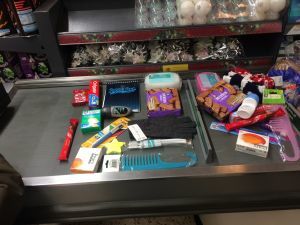 Make a shoebox filled with goodies and pass it to a local homeless shelter or charity. Send a thank you card to your GP for taking care of you through the year. 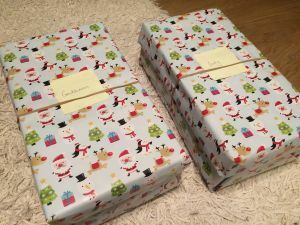 Take presents into hospital to be given to those who are without family. Give flowers to a relative. Leave a Christmas card on your doorstep for your postman. Make mince pies for your neighbours. Leave a book in a café with a note that it’s a present for whoever finds it. Draw happy pictures for your friends. Donate good quality toys and clothes to charity. Take food and blankets to an animal shelter. Run an errand for a family member, friend or neighbour. Give the office staff at your school a tin of biscuits. Handmake Christmas decorations (like these) together and give them to a retirement home. Make a meal for someone who could do with a break. Send a friend a gift (such as a buddy box) by post. Feed the local wildlife and leave out fresh water. Order a cup of tea or coffee at a small independent café and leave a generous tip. Read a story book to someone. Donate food to a soup kitchen. Dry the play equipment at the park with a towel after it rains, whether you’re making use of it or not. Donate colouring books and crayons to local families in need. Write a happy chalk message on your driveway. Take a selection box of chocolates into the bus station. Buy a hot drink for someone working outside. Donate new books to your school. Donate new books to your doctors’ surgery for the waiting room. – Pop into your local emergency services station with some treats – these are always very much appreciated! Great ideas! My little effort has been to support a friend who has had a multiple heart bypass operation. Last Friday I took him out for a tea and cake at a local nature reserve. Maybe someone near you, who can’t drive or walk very far, would appreciate some time. I like the Christmas card for the postman. All weathers – hot, cold, wet, windy, he (sometimes she) turns up regularly every morning. Well done to the boys for adding their ideas. Nice one! You and the boys have been very thorough in your lovely suggestions. I can only think of one extra act of kindness, have video chats with people who are unable to get out and about easily. Popping back from #blogstravaganza ….today we dropped a fave book at the train station for someone to read on their journey with a note!! This is such a great idea. I love the idea of giving to others this time of year. SUPERB idea Jo! Love this post. With the commercialisation of Christmas, and little children making long lists for Santa, this is a breath of fresh air. We need to realise Christmas is as much about giving and helping than about receiving. Thank you. Yes, it feels so important to shift focus away from the lists and the hurried trips for luxury items when others are not so fortunate. Our boys have especially enjoyed putting together the shoe boxes this year and thinking about what people might need as well as what they might like. It’s nice to find that balance with them. Love this idea. Great post!!! I’m glad it’s inspired you 🙂 never too late to start though!